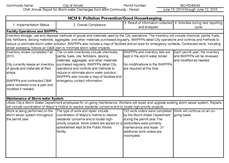 The City of Arnold, Missouri is the largest Municipal Separate Storm Sewer System (MS4) holder of a National Pollutant Discharge Elimination System (NPDES) Phase II permit in Jefferson County. The City of Arnold has been in the permit program since 2003 and has 293 stormwater outfalls over approximately 30 miles of creeks, streams, and rivers. 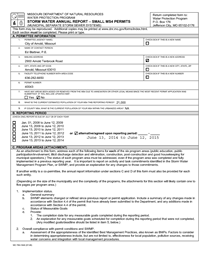 The City’s MS4 Stormwater Management plan outlines the City’s Minimum Control Measure goals for complying with the permit. The City of Arnold employed the professionals at Intuition & Logic to assist with the City’s compliance efforts and annual report preparation. For the 2014-2015 reporting period, Intuition and Logic helped the city meet its compliance and reporting goals by performing dry weather screenings of 20% of the outfalls and performed water quality sampling and testing for two locations where dry weather flow was observed. 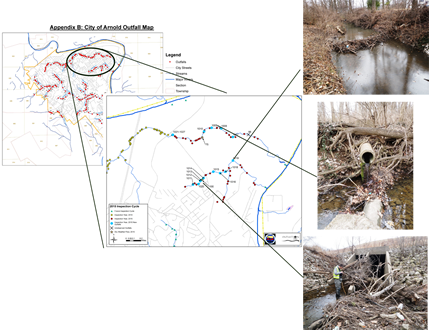 During the fieldwork, we also identified problem areas such as threatened infrastructure, debris jams and beaver dams and reported our findings to the City. As part of the City’s educational goals we gave two training seminars to city staff and professionals from the engineering community and neighboring MS4 permit holders. We regularly met with City staff and tracked the City’s compliance efforts to help ensure the City was on target for meeting its goals. 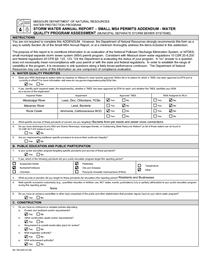 We also prepared the annual report forms and supporting documentation for the City’s use in submitting the completed report to the Missouri Department of Natural Resources.